"Orson Welles meets HG Wells"
The stories of science fiction are a way for us to imagine the future of our species so that we can strive toward the most enlightened and glorious future possible. When we take the time to enjoy a science fiction story, most of us expect to be entertained by visions of a technologically advanced future, one of faster-than-light starships and whiz-bang devices. In short, the "space opera". However, the stories of H.G. Wells approach the future from a slightly different angle, Wells wrote less about wondrous devices and more about the future of people. Herbert George Wells was the youngest of four children born to Joseph and Sarah Wells of Bromley in Kent, England, 1866. An inheritance had allowed the Wells family to invest in a small shop selling knickknacks, china, and sporting goods, but the stock was out of date, the shop in a poor location, and rarely profitable. Robust Joseph Wells was able to occasionally supplement his income as a batsman and bowler for the Kent County Cricket Club, but cricket was considered a gentleman's pastime in Victorian Britain, and pay for "professionals" came from donations after the match. "Bertie" was apparently not as robust as his father, and an accident in 1874 left him with a broken leg and bedridden. Joseph brought him books from the local library. The younger Wells read voraciously and developed a desire to write. When his leg was sufficiently healed, he entered Thomas Morley's Commercial Academy. The family's fortunes took a turn for the worse when Joseph fractured his femur, ending his career as a cricketer. The boys were forced to take apprenticeships in various trades, and Bertie worked as a draper under harsh conditions in Southsea. The experience would color his novels The Wheels of Chance (1896) and Kipps (1905). Sarah took a position as a lady's maid at Uppark house in Sussex but was not afforded lodging for her children or disabled husband. However, Bertie was allowed access to Uppark's extensive library, and he was introduced to Plato's Republic and More's Utopia, marking the beginning of Wells' entry into the world of literature. For a short time, Wells was able to join the National School as a pupil-teacher. In this manner, he was able to pay for his advanced education by teaching the basics to younger children, but the situation closed over irregularities in his qualifications. He was eventually able to leave the draper's emporium and secured a position at Midhurst Grammar School where he continued his self-education, eventually winning a scholarship to the Royal College of Science where he studied biology under Thomas Huxley ("Darwin's bulldog", an outspoken advocate of the theory of evolution). Wells joined the Debating Society and began to develop ideas for reforming society in a Utopian image. The Time Machine (1895) was one of Wells’ first "scientific romance" novels, and has become a classic of the science fiction genre. Best remembered for its exploration of the Time Travel concept, the story is also a showcase for Wells' developing Socialist ideals. Wells called The Island of Dr. Moreau (1896) "an exercise in youthful blasphemy", but the novel deals with a number of moral and philosophical themes, including moral responsibility, pain and cruelty, human interference with nature, and the values and traits which give us our human identity. The Invisible Man (1897) became one of the foundations of the science fiction genre and the greed for power of its protagonist make it a story of "science without humanity". For fans of Old Time Radio, Wells' most notorious story is The War of the Worlds (1898, although that notoriety is better credited to Orson Welles than H.G. Wells). It is one of the earliest literary examples of a conflict between mankind and an extraterrestrial race. The tale was written while the British Empire was engaged in a Dreadnought arms race with Imperial Germany and the popular press was filled with jingoistic fears of invasion of the British Isles from a Continental power. Orson Welles' infamous 1938 broadcast of the story took place while the Fascist powers in Europe were employing a policy of expansion into neighboring territories, generating similar fears in America. In 1940, H.G. Wells was visiting San Antonio, Texas, to address a group of brewers. He became lost and asked a stranger for directions. The stranger turned out to be none other than Orson Welles who was in town for a town hall address. The pair got along immediately and spent the day together and were interviewed on local station KTSA. While Wells was generous about the liberties Welles took with the story, he did appreciate the renewed interest in his work. Wells was a Socialist and a member of the Fabian Society, but his political views outran those of the Fabians. He was especially sensitive to the British class system. Surprisingly, he surrendered his pacifist views and supported Britain's role in the First World War. 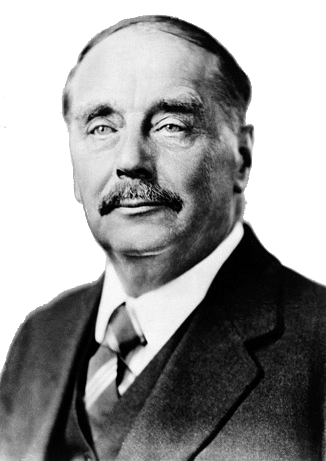 Wells is credited with the originating the term "the War to end all Wars", and was sorely disappointed with the failure of the post-war League of Nations. It was his strong belief that the formation of a World State was inevitable. While most of his wealthy neighbors retired to their country estates during the Blitz, Wells remained in his Regent's Park flat and walked his own fire watch as part of the civil defense effort. Be the first to comment on "H.G. Wells"